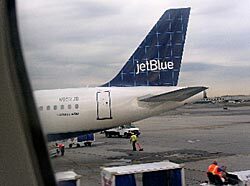 I flew JetBlue to NYC this weekend. The only flight they have out of Seattle is a nightly redeye to JFK. JetBlue has a similar business model to Southwest, offering cheaper prices by doing away with meals and purchasing a fleet of small airplanes to focus on a flights between a few select airports which offer them favorable financial terms. But in a few respects, JetBlue is better. 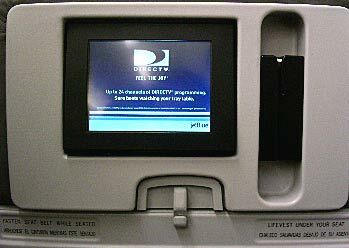 You don't have to draw numbers for seats, they don't have seats that face each other, and best of all, they offer 24 channels of DirecTV for each passenger. Among the channels offered are CNN HLN, NBC, MSNBC, ESPN, ESPN2, ESPN Classic, ESPN News, Discover, and the History Channel. I was able to catch up with all my fantasy football players on the flight home. One of the highlights of my weekend was meeting and hanging out with my nephew Ryan. I don't find newborns all that cute; they look like aliens. 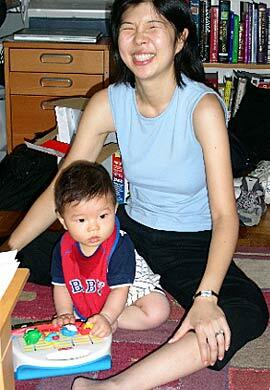 But after a few months have passed, babies become amazingly cute. They become amazingly chubby which gives them plump cheeks, five to six chins, and rolls of fat at the joints of their arms and legs. Ryan has hit that stage of adorability. He loves peek-a-boo and is very ticklish. 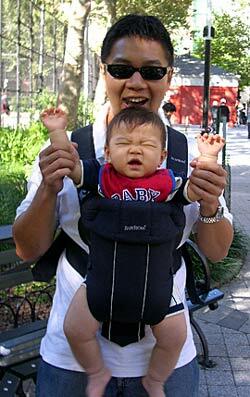 Here is my first ever attempt at wearing a baby in a Baby Bjorn. It may look like Ryan is crying, but I promise he isn't. He's actually practicing his "I just won the U.S. Open Men's tennis final and I want to show more emotion than Pete Sampras" victory scream. People say that women gain weight after their first baby, but all of the new moms I know look just like nothing every happened soon after their baby was born. Sharon is no exception. Of course, having to get up several times in the middle of the night will do that to you. Mother's are much better at that whole "get up to play with the screaming baby in the middle of the night" thing, and a side benefit for their sacrifice is additional calorie consumption. Here, I was telling Ryan to "smile! smile!" and Sharon thought I was talking to her. Alan and I took the 7 to catch the U.S. Open women's final. 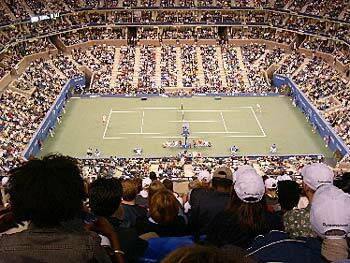 We were in section 331, which may sound high, but there aren't really any bad seats in Arthur Ashe Stadium. 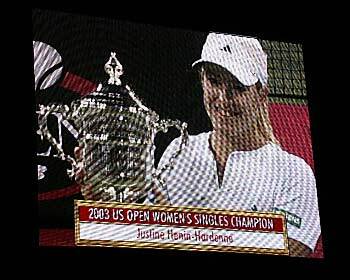 Still, from that section, the closest one could get to winner Justine Henin-Hardenne was outside the stadium, under the big screen. The loser of the Open gets $500,000, and Henin-Hardenne took home $1,000,000. When that figure was announced, a guy sitting behind me and resembling comedian Dave Chappelle started shouting, "Marry me, Justine! Me! Me!" She is kinda cute, but the most attractive part of her is definitely her game. She's not very tall, but she gets her whole body into her serve and and groundies, basically hitting the crap out of every ball she can get her racket on. I also wish I had some video of James doing his card tricks. Last we met, he was Luke Skywalker in the beginning of The Empire Strikes Back, unable to lift his X-Wing out of the swamp in Dagoba. This time, he was like Luke at the beginning of The Return of the Jedi, powerful and monklike, ready to meet Vader. His ambitious card trick is super smooth now. The weather in Manhattan was perfect, a postcard from an autumn to be. I'm quite jealous of the fact that you can order just about anything and have it delivered to your door. Pizza, sushi, Chinese takeout, Vietnamese, drycleaning, Krispy Kreme...I could so use that type of service in Seattle.